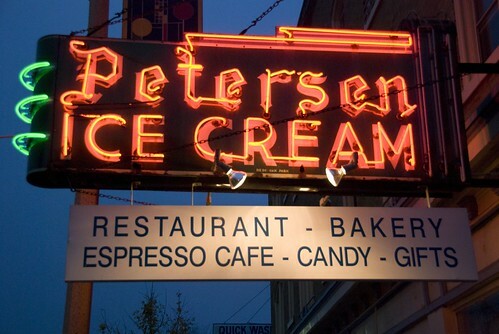 Long before Fenton’s Ice Creamery in Oakland ruled my world, there was Petersen Ice Cream on Chicago Avenue in Oak Park, Illinois. I took this photo recently on an early morning drive from the airport through Oak Park. I lived here for nine years before I moved to California in 1998. I remember I became fascinated with Oak Park when I took the “el” train to see the movie “Reds” in early 80′s with friends at the Lake Theater. I knew then that I wanted to live there. Five or six years later, I made my move and I loved it. Oak Park will always hold a special place in my heart. You are currently reading Petersen Ice Cream at Simply J Life.